For some people, yard work is a joy. They love being outside, they love working in the dirt, and they love to see the things they plant grow. Then there's the rest of society. Yard work is hard to keep up with, it takes a lot of time, and there just aren't enough hours in the day. Regardless of which camp you're in, at Stoeckig Landscape Group in Roswell, GA, we know that there are some great reasons to have your yard landscaped and well-maintained. Here are 3 benefits to landscaping your yard. A great landscape design will have you wanting to go outside, and being outside has some benefits. It reduces stress, allows you to breathe fresh air, and can increase your activity level. Your yard could make it difficult to be outside if all you see are chores that need to be done. When you see a beautiful space, you'll feel more relaxed and want to enjoy your yard. If you’re lucky enough to have an outdoor space attached to your home, you should feel good about using it. 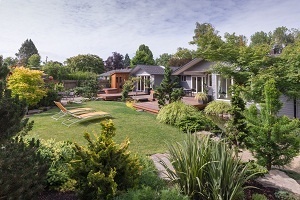 Landscape designers can help you find a yard that you'll share with friends and family members. Face-to-face connection is still more important to happiness than any other type. Get your yard looking beautiful, and you'll head outside to play with your children or have a barbecue with people you haven't seen in a while. It's these connections that will make the biggest and best difference in your life and the lives of your friends and family. If you need to move, landscaping in Roswell, GA, can increase the value of your home and your ability to sell it. Your front yard is the first thing that any potential buyer will see. Taking care of the outside will give the impression that you take care of the inside. Reinforce that first impression when the potential buyer enters the house, and you have a great chance for a sale!